Lexington’s new parklet took two downtown parking spaces. A GENERATION AGO, convenience drove retailers to trade city and town centers for shopping malls. Technology has now rendered that trade obsolete. Consumers with smartphones carry limitless shopping around in their pockets. And because an online purchase will always be easier than driving, parking, and walking to a store, the calculus around healthy retail districts in cities and town centers has shifted. In Lexington, this new calculus has the town jettisoning a pair of in-demand parking spots. The town gladly made the trade, because in city and neighborhood centers today, it’s more important to be interesting than it is to be convenient. Clusters of brick and mortar retailers can’t top the Internet, so they need to change the game and give shoppers reasons to come downtown. This means rethinking public spaces that haven’t been touched in decades, like streets and lifeless sidewalks, and reprogramming them with parklets and food trucks. It means creating unique experiences on a pedestrian scale, because when pedestrians come downtown, they spend money. Lexington turned two parking spaces on Massachusetts Avenue into a miniature park last year. The parklet offered plants, flowers, seating for a dozen pedestrians, and parking for 20 bicycles. 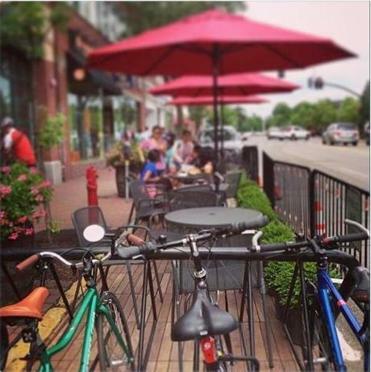 The parklet made on-street parking slightly tighter, but it also helped to draw scores of visitors — drivers, pedestrians, and bicyclists alike — to the town center. The town was willing to sacrifice a couple of parking spots because its streets are an economic asset, and when they’re the exclusive domain of cars, they’re choking off potential business. A group of San Francisco activists and designers built the country’s first parklet nearly a decade ago, when they fed the meter at a single downtown parking space, and filled the parking spot they’d just rented with sod, a bench, and a tree. When the two hours on the meter ran out, the sod got rolled up, and the park disappeared. That 2005 incident was part protest, part art project. It was citizens hacking the public street. They hit on something, though, and municipal governments soon ran with the idea. San Francisco began permitting the conversion of on-street parking spaces to parks in 2010, and the city now boasts more than 40 of them. Former New York mayor Michael Bloomberg did San Francisco one better: He and his former transportation commissioner, Janette Sadik-Khan, built scores of pedestrian plazas on top of formerly active roadways and parking areas. New York paired its pedestrian plaza construction effort with an ambitious expansion of the city’s bike lane network. Sadik-Khan, speaking recently in Cambridge, described New York’s efforts to better accommodate cyclists and pedestrians as a “battle for world-class streets.” Wherever Sadik-Khan waged this battle, conditions improved. Streets looked more inviting, and more non-motorists used them. Traffic accidents declined. And, most importantly, business boomed. Retailers along the city’s first protected, signalized bike lanes — lanes that cost some on-street parking spaces, and moved the remaining spaces off the curb — saw a 49 percent bump in sales. Retail vacancies fell. Local shops around one Brooklyn pedestrian plaza, built atop a former parking triangle, saw sales soar by 170 percent. Boston’s tentative foray into parklets — a pair of poorly designed, poorly located structures — flopped last year. But the data from New York show just how effective the structures can be when they’re done right. Whatever business retailers lost to tighter parking, they more than made up, because the amenities that replaced the parking became magnets for new customers. That’s the same lesson Lexington learned when it planted flowers, chairs, and bike racks on a 50-foot-long stretch of Massachusetts Avenue asphalt. It showed the importance of connecting streets, even leafy suburban ones, to the buildings that surround them.